CUSTOMER: Flying Beds International, Inc.
LINE ART CUATAWY VIEW DONE IN ADOBE ILLUSTRATOR. 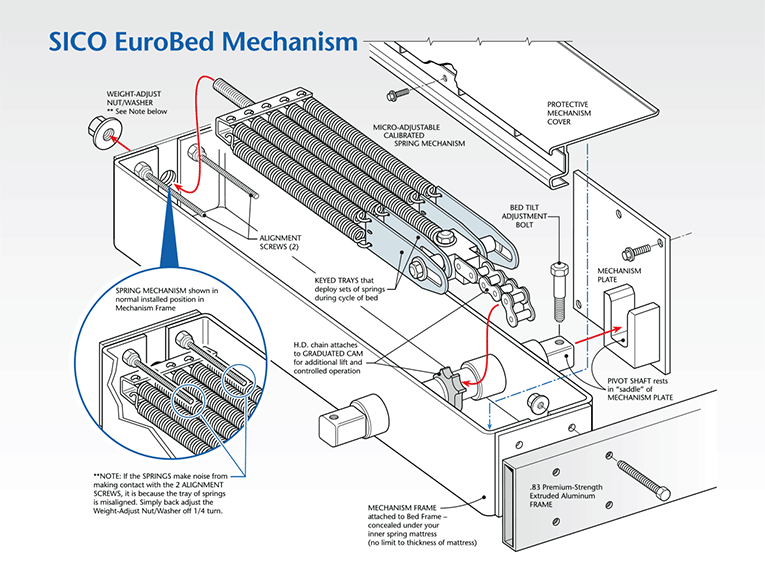 Micro-adjustable Calibrated Spring Mechanisms — Relatively lightweight and compact, the SICO® Eurobed is the system meant for tight spaces. The flexible wooden-slat mattress support and powerful mechanisms provide comfort and effortless use. Nine factory-calibrated heavy-duty springs in each mechanism allows for precise tension adjustments. This mechanism is superior to other Murphy style-wall bed systems that use a few small helical springs or gas pistons. Each tray of springs are cantilevered to be called into action at separate angles of bed rotation. As the bed nears the down position, maximum strength is deployed. This feature is unique to SICO.